This might be my perfect meal — a chicken salad sandwich on walnut bread, a side of Terra chips, some pickled carrots, a can of Diet Sprite (Update: change to Chardonnay) and a slice of buttermilk chocolate layer cake. I’d rather have those than just about anything – especially the chicken salad which is kind of a splurge food around here. I love it, but I’m always trying to budget calories for chocolate cake and cookies, so my meals have to be lean and low in fat. My favorite chicken salad is not exactly light, but you could always use reduced fat or just add more chicken so you get a smaller ratio of dressing. This one has lots of dressing. I don’t know the origin of this recipe but it appears in a couple of my Junior League books with the title “Bridesmaid Chicken Salad”. It usually calls for pineapple plus slightly more lime juice and lime zest, but you really can taste the lime, so I like to tone that down a little. For the chicken, cool and chop. I use the giant bone-in chicken breasts, sprinkle them with some Cavender’s Greek seasoning, put a pat of butter under the skin, then roast at 350 for about 50 minutes. Roast chicken on the bone has so much more flavor than boiled, but you can use whatever chicken is convenient. Just not canned. It’s not allowed. Just kidding. Mix together all ingredients in a bowl. Serve on a bed of lettuce topped with more almonds or serve as the filling of a sandwich made with good bread. Oooo, I think I was in the mood for this today. The leftover egg salad from the work fridge did not hold a candle. 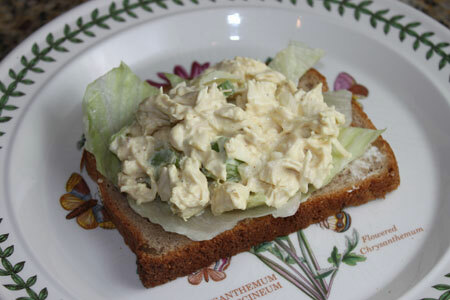 This is really similar to what I know as “Coronation Chicken Salad.” I think because it was created for Queen Elizabeth’s coronation back in the 50s. But you add raisins to it, which is so good! Your ideal meal for the day sounds awesome! Yvonne, Smucker’s makes it so you should be able to find it. It’s usually on the condiment aisle near the mustard and mayonnaise. That’s a really cute name for a chicken salad.It looks delicious! Looks delicious Anna! Also wanted to let you know that I have made your Killer Kahlua brownies several times now and have finally blogged about them on my site. They are the best brownies I’ve had yet…..Thanks for that recipe. I am now out of Kahlua and have to buy more!!! I’ve never added curry powder to chicken salad but planned on trying it after I read in the newspaper about a person whose MRI showed their brain size was greatly decreased and they were diagnosed with Alzheimer’s disease. The patient had heard about the turmeric in curry possibly contributing to a decrease in Alzheimer’s disease in India, so they added it to their diet by eating it in chicken salad 3 times a week. The doctors couldn’t believe how the patient’s cognitive abilities were restored. Thanks for the delicious sounding recipe, I’m definitely going to give it a try. During my non-vegetarian days I always loved chicken salad–actually, with curry powder the vegan mayo Nayonaise (at 35 calories a tablespoon) is really, really good. I’ve tried cashews in tofu ‘chicken’ salad but not almonds yet, and I love the idea of adding lime. Is walnut bread like date nut bread? Date nut and cream cheese sandwiches were another favorite of mine as a kid. YUM that sounds like a delicious lunch actually! It been so long since I’ve had chicken salad with freshly cooked chicken. Such a difference between the canned stuff. You probably already know this trick, but I sub in 0 percent fat greek yogurt for the mayo in my chicken salad recipes, and now I prefer them that way. The yogurt adds a nice tang, and the greek style is still luxurious texture-wise. I also realize when you’re craving something, it’s often better to go with the full fat version, or you just won’t be satisfied.